After reading the Marina report, in this weeks news letter, from QVM. I felt like we are going backwards. Here we are, traders and supposedly management working together. For the greater good of the market. It Really doesn't feel like it. When we have senior management trying to abolish our point allocation system. This system was introduced to protect management and traders. From unfair treatment of stallholders, and to protect management in unwarranted accusations. This was approved by council at the time, it was devised by a group consisting of traders, management and council. So it would be fair to all. But this is not to say, that some changes are needed, to bring us into current times. Management has said write to us if you have any objections. But honestly, who would dare to with a system like this on place?" Cant put my name on this one . In the good old days, any dispute over who should get a prime stall was pretty much settled by a points system whose main criteria was length of service in the market. As our writer says, it is probably time that system was reviewed. The new system has some points of merit although it has been devised inhouse and it really needs to be the subject of an open and comprehensive evaluation by those who are expected to abide by its provisions. Our contributors suggestion of potential persecution is a little over the top but certainly management do need to do a better job of selling this concept and allowing detailed examination of what they have in mind. 1. Myer says same store sales up. 2. Proposed banning of net fishing in Port Phillip may impact on fresh fish supplies. 3. Former Woolworths boss, Roger Corbett, returns as advisor. 4. Woolworths shares rise on buyout speculation for Big W.
5. ACCC fines Chemist Warehouse for falsely claiming discounts on homebrand products. 6. Good Guys remove “Pay Cash” from its “Pay Less, Pay Cash” slogan. 7. Customer trending company, Path Intelligence, closes down. 8. Billabong shares dive on declining Australian dollar and challenging retail market. 9. K-Mart and target top most visited toy stores for kids. 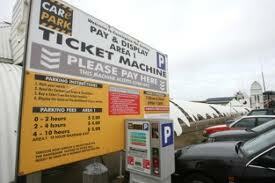 A QVMAC sub-committee was set up recently to examine options for free car parking in the QVM car park. There are restricted times during which shoppers can currently enjoy free parking but traders were keen to see some form of free parking at any time of day in an effort to boost customer attendance and remove one of the major criticisms of our market. The QVM car park is an important source of income for the market and essentially it is income that allows other expenditure to take place. Offering free parking has significant cost penalties – many thousands of dollars – and yet it is a desirable factor in attracting shoppers. The last meeting of this sub-committee was considered very productive and an option was formulated that would involve a trial of 1 hours free parking (with $4 for the second hour) at any time of day during February. We were advised at Thursday’s QVMAC meeting that the Board had rejected the proposal and Board Member, Jane Fenton, was on hand to explain the Board’s decision. The Board was presented with just one option, for a limited free parking offer at anytime during the month of February. The market was going to suffer a significant reduction in income during the trial and yet there was no way put forward of measuring the results. There is no dollar measure of trader’s sales and any increase in patronage at the car park could simply be city shoppers taking advantage of QVM's free parking but spending elsewhere. In the Board’s view that would not make for a good business decision. The door is still open to other options including a variation on the free parking offer, the possibility of trader’s contributing to the cost of parking, or some form of voucher system. We will consider other options but one important thing needs to change. This had been a lengthy consideration and somehow we need to shorten the management process so that a speedier solution can be reached. What Is Happening With The Trader’s Association? QVM Traders Inc was formed back in May 2014 and at that time we were considering a subscription model which required all traders to contribute a 1.25% levy against their rent payments to support the association. For a number of reasons that format didn’t get traction and the association has remained idle since. A professional traders association is seen as a very desirable element for QVM and markets expert, David O’Neil, identifies it as a key ingredient in successful overseas market models. A professional traders association would ideally have a number of roles, not just looking after trader’s interests but also having a purpose and vision dedicated to making QVM a better market. If there was a criticism of the original association development it was that it concentrated just on traders interests and not enough on the bigger picture of how a modern public market could tackle the revolution currently going on in global retailing. The good news is that the purposes of the association are being re-examined to see how it might fit into our future. 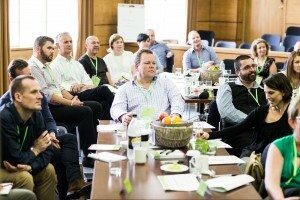 Traders are keen to see to establish a grass-roots forum for trader involvement and management are keen to get a structure in place that will allow all the important discussions around renewal to be as productive as possible. 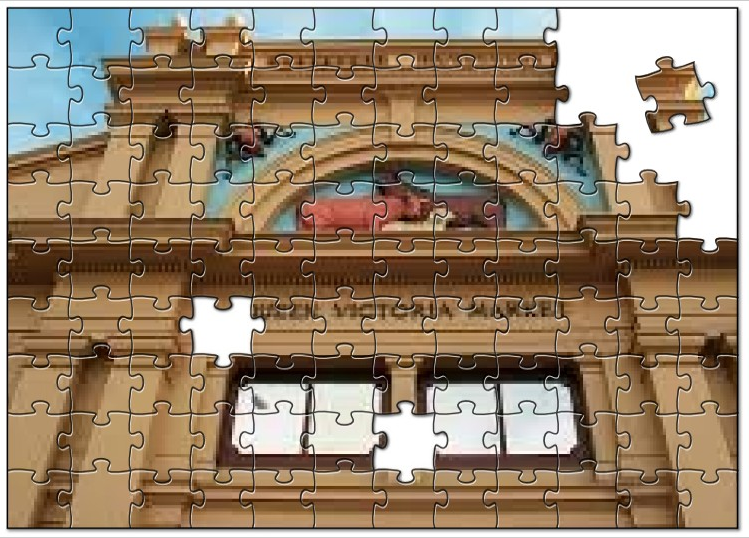 Current thinking is that the Queen Victoria Market Advisory Committee (QVMAC) and QVM Traders Inc (QVMTI) could be joined in purpose so as to achieve one body. The QVMAC and its elected Trader Representatives has already made a significant contribution to progress at QVM. The upcoming renewal process will place a significant workload on all participants and a structure that gains deeper input from all traders will have a valuable role to play. We are very much at the preliminary discussion stage and there is a lot of detail to go through, but the aim will be to have a joint structure operating, possibly as soon as February/March 2016. There is little doubt that our market would benefit from a joint effort that concentrates on market performance and the sustainability of stakeholders whether they are trader or property owner. We just need to get it right this time. 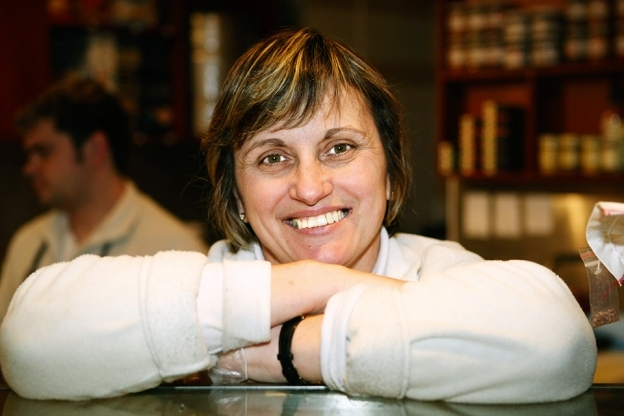 21/12/2015 08:45:14 What is happening with the Traders Association? 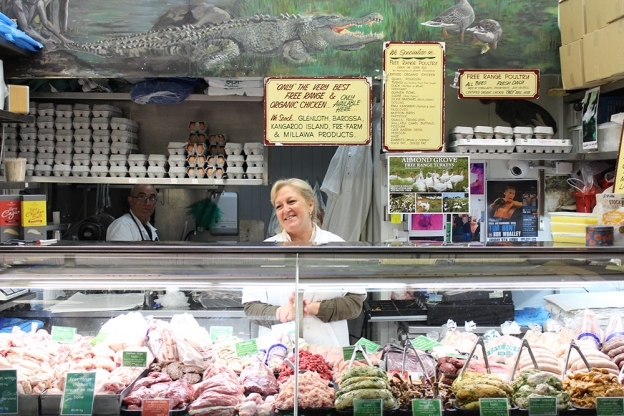 "The Queen Victoria Market is iconic. I would also suggest that some of the Market's stallholders would fit the same tag...many of your trader reps have been around since the 1980's. The importance of a cohesive and unified voice from trader ranks is vital. There is so much experience in that voice that, not recognising and using trader input would be criminal considering the mammoth tasks facing the Market over the next few years. From a management view, there is nothing more frustrating than having to deal with Market factions, each generally having a different axe to grind. My personal experience with stallholders goes back to 1981, I must admit that in those early days there was very little formal consultation...that is until the formation of the Queen Victoria Market Advisory Committee in the mid 1980's. Trader input was important to me in my time in Markets...most of that input though came from personal ""market floor"" communication. The Queen Victoria Market Advisory Committee met on Thursday, attended by Trader Representatives, members of management, and Board member Jane Fenton. This is the bi-monthly meeting and as usual the agenda was full. Following is the meeting agenda with some explanatory comments in italics where appropriate. We are unable to give you details of the actual discussion until the minutes have been published and approved by all attendees. That will happen within coming days. By publishing agendas and minutes it is hoped that all traders will have a better understanding of the broad range of issues that the committee considers and how those issues are progressed and actioned. 2.1. 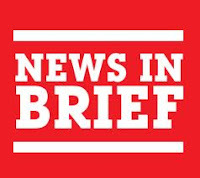 Report on Brand Launch** (MS) – a full report will come at our next meeting. Some aspects of the Brand Launch are still in operation e.g. Melbourne tram. 2.2. Trading Ideas - Marketing Presentation (MS) The last Monday night session was considered very useful by traders who attended. It included a presentation from Nunn media and some of the decision making around TV advertising versus radio advertising and how much exposure you get for a given marketing spend. It was proposed that a useful subject for an upcoming Monday night information/discussion might allow traders to give input into the 2016/17 marketing budget. 2.3. Stir Frydays Update (MS) – Again this event is still running but there were some initial discussions around how to better activate the Dairy Hall into a street market or indeed make the street market an adjunct to a Dairy Hall event. This is the first year of Stir Frydays and it was considered that there were positive signs to work with. 2.4. Market Awards (De-brief) (MS) – A successful year with two QVM Traders winning their categories across Melbourne markets. There was discussion around increasing the impetus of this sort of event as Melbourne’s markets push their relevance in a competitive retail world. 2.5. 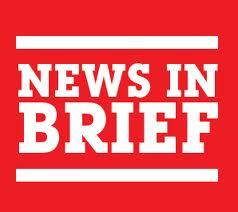 Christmas Trading (Attachment - A.1) (MS) – see the insert in this weekend’s Traders Bulletin. 2.6. Sydney Market Conference (MS) - a brief report from Mark Smith on the recent national conference. 3.1. Trader Assessment/Selection Criteria (A.2) (ML) - The assessment/selection criteria for traders has recently been a point of contention with traders largely because its details have not ever been clearly identified or debated and its relationship with pre-existing assessment criteria (the points system) have not been clarified. The basic criteria for assessing and selecting traders will be published in this weekend’s Trader’s Bulletin and the door will be open for discussion. 3.2. Update on 507 Elizabeth St (ML) – This concerns the lease for the current croissant shop on the corner of Therry and Elizabeth Sts. There have been a number of parties interested in the site however following a series of interviews and the assistance of a food consultant it has been decided to advertise for tenants. Applications will close at the end of December. 4.1. Car Parking Update (BD) – see separate article on Victraders.com. 4.2. 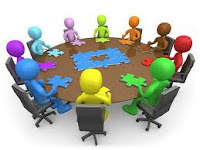 QVMAC & Trader Governance Structures (A.3) (BD) – further discussion took place on a suitable structure to enable discussion and decision making around renewal including the concept of a joint role for QVMAC and QVMTI (Traders association). - see separate article. 5.1. Trader Input to Marketing Plans (KN) – this was an issue raised by Trader Representative Kha Nguyen concerning the results that come from marketing programs and how we measure those results. 5.3. Emergency Management Plans (CU) – this concerns the potential threats illustrated by recent world events. Safety information has been made available for traders on the Trader’s Hub. 5.4. A-Shed Activation Program (JP) – Jenny Pyke raised concerns over the slowness of activating A Shed following the movement of traders from the north side to the south side of A Shed. Marina Levitsky presented a graphic of current measures to activate the shed including new food related traders, new seating and the Story Box community library. 5.5. F-Shed – Status of new coffee tenant (JS) - the new tenant at the top of F shed on Peel St. is expected to be active by 20th December 2015. 5.6. Minh Phat - future tenancy options (All) – like all tenants on Therry St. Minh Phat will be subject to displacement as a result of building construction on the Munro site. That is not expected to happen before 31/7/2016. 5.7. Summer Night Market – Programming (JP) – there has been some concern over the slow start to the Wednesday night market. Competing events and poor weather have contributed to reduced sales. The market has recently injected extra funds into advertising the night market. 6.1. 2016 Meeting Schedule (BD) - we are expected to move to monthly meetings as renewal activity ramps up. 6.2. Australia Day Market (MS) – the market will be closed on Auatralia Day - Tuesday 26th January 2016. Stan from Eggporium came up with these ideas and he covers some very worthwhile subjects. "1. All stall holders should have a bigger presence on Facebook - a very untapped marketing resource. 2. QVM should have an App to guide customers to daily specials, cooking demos, live music, tastings, daily happenings, public transport tips. 3. QVM website needs a big update. 4. Promote a meet farmers/producers/suppliers Saturday morning. 5. Free 3 hour parking day once a month. 6. A free QVM cotton tote bags to customer who ask for them via a marketing campaign. 7. Better public announcements promoting facts about the market, educate our customers. 8. Free QVM bumper stickers "QVM Est 1876 - Come visit The World's Biggest Market "
9. Promote Celebrity Cooking Days - via cooking shows on TV. 10. 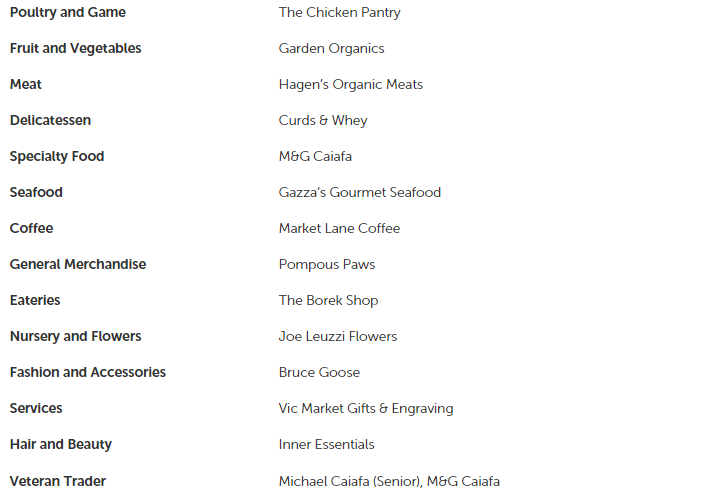 Have QVM Ambassadors - Male - Con the fruiterer, Female - Maggie Beer or similar. 11. Locals loyalty discount - Customer to show stall holders proof of a CBD address to get discount or a free tote bag or similar. There is so much passion at QVM it should be bottled and harnessed. We all could channel our positive energy and creativity to make the QVM the best in the world." Smart Engaging Ideas That Traders Can Use. Engaging your customers and creating a bit of theatre in the process is seen as a major imperative for traders and one where our personal focus can be maximised. 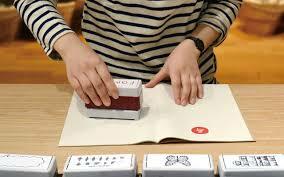 Muji, the respected Japanese retailer, has just opened a flagship store in New York and some of their innovations help create that individual relationship that customers seem to crave. Embroidery Station - a range of clothing can receive personal embroidery treatment on site with a variety of design options. Fragrance Factory - individual recipes for room air fresheners can be concocted on site by adding personal favourite fragrances to the mix. Bacon & chocolate fragrance anyone? Carry Bag Design - this might be a little less significant in the personalisation stakes but being able to decorate your carry bag at the counter using a range of fun stamps creates unique individual packaging for that special gift. In a world of mass production and sameness, the opportunity to create an individual purchase for your customer can be very profitable. The ideas mentioned above are feasible for market traders and no doubt there are many other similar ideas that don't require a huge outlay. Why not try experimenting right now? 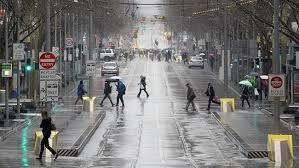 Few City of Melbourne decisions upset traders more than the apparent attempt to remove cars from the CBD but recent moves within Council suggest that wiser heads are prevailing at least for now. Councillor Richard Foster has been removed from the councils transport portfolio following his suggestion that cars be banned from the CBD for one day. Councillor Fosters idea was roundly condemned by the Lord Mayor and the State Premier as being unworkable. The Councillor was criticised for breaking ranks and talking without consultation with his fellow councillors. They can be a tight lot at the CoM and that is a good thing for responsible and reliable decision making. Cr, Stephen Mayne has replaced Richard Foster as Deputy Chair of the transport portfolio, Rohan Leppert replaces Cr. Mayne as Deputy Chair of the planning committee. The Age has reported that parking reform, including reducing the city's reliance on parking revenue is a key ambition of Cr. Mayne. Whilst there is little doubt that the long term plan is for the city to shed its reliance on cars, doing it in a measured responsible way is good news. Just what impact that will have on Trade at QVM remains an issue for traders. 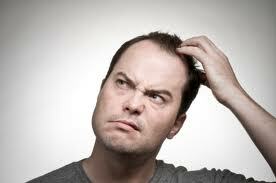 How often do you hear a QVM trader say "People just haven't got the money to spend"? Well that seemingly vague and pointless comment has now got support from a major international company and a solution to this problem may be found in the actions of one of our former Prime Ministers. According to an article in the Harvard Business Review, Hersheys (one of the world's largest manufacturers of confectionary) was blaming its lack lustre performance on one major factor. It said that the average person was simply too poor to buy their products and allow their company to grow. You might remember that Cadbury in Tasmania recently decided to make its chocolate bars smaller rather than increase prices for similar reasons. So maybe this "no money" thing isn't just a casual observation but one born from a stagnating world economy where people work harder and longer, and spend more of their income on mortgages and health care than ever before. The answer in the HBR article was for central banks to suddenly give everybody a big injection of cash. How silly is that? But, hang on, isn't that what Kevin Rudd did immediately after the GFC? 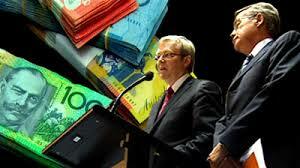 Back in 2009 a government stimulus package gave every Australian up to $950 as a cash payment. Many people felt all warm and fuzzy over that decision and went out spending. That was 6 years ago. There was a lot of debate about the effectiveness of the stimulus in the aftermath but some heavy hitting economic commentators said it did help avoid a recession. Maybe it is time for another official government stimulus package. I want to feel all warm and fuzzy again and buying a chocolate bar will be high on my list of purchases. Questioning Building Heights On Therry St. The lead up to a Planning Amendment for the market precinct has raised some questions, particularly over the building height limits on Therry and Queen Sts. 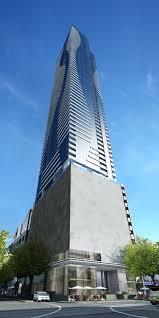 The following is in response to our article - Amending Building Heights Around QVM. 23/11/2015 14:47:02 Amending Building Heights Around QVM "DDO11 states:Podiums fronting Therry Street and Queen Street north of Franklin Street should have a minimum podium height of 10 metres and must have a maximum podium height of 20 metres. Podiums fronting other streets should have a minimum podium height of 20 metres and must have a maximum podium height of 40 metres. When I asked at one of the meetings why it was necessary to state a minimum podium height, no answer was given. It seems counter intuitive to insist on a minimum 3 story podium when what exists now is 2 stories and fits perfectly with the scale needed on the street. Buses are a regular topic of conversation amongst traders. It is simple - buses carry passengers - passengers with money are customers - customers are a traders source of income - the more customers we have - you get the idea. Customers can be attracted to our market by a number of methods and the best method is for traders to make themselves so irresistible to their customers that they literally fall over themselves to get here. That is not exactly the environment we are currently in so we need to try alternatives. Traders are convinced that buses are a viable alternative but buses don't seem to fit into the marketing teams plans apart from cruise ship buses where the market has recently sewn up an impressive looking deal with a major operator. Traders are so keen to try buses that many have quite detailed views on how a bus system might work and, despite tough times, they are even prepared to offer contributions to bring them to the market. So what is involved here? Concept - buses would be hired to bring customers to our market from surrounding suburbs, city hotels and perhaps even nearby regional areas. 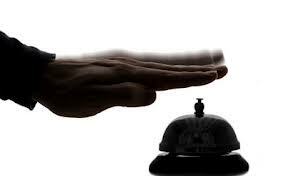 There would be liaisons with hotels, community groups and other suitable organisations. Incentives - the buses would be free for the passengers and traders would offer vouchers or discount incentives to passengers. Services - buses would be met on arrival and a central pick-up point would be established where customers could leave their purchases for packing and loading while they continue shopping. The aim will be to make this experience as enjoyable and stress free as possible for the customer. Special offers - special deals could be offered for food and beverages while at the market to encourage longer stays. 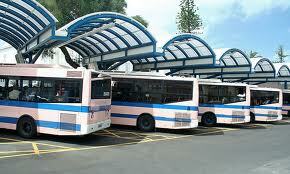 Financing - traders would each contribute say $5 per trading day towards a bus hire fund. There is a lot to think about here but one of the beauties of the proposal is that it can be trialed for virtually any length of time without major overheads and feedback in the form of extra sales should be reasonably easy to identify. What do you think? Would you support a bus hire scheme? Would you be prepared to get involved in the organisation of buses.? What features do you think should be included in the scheme to maximise its impact? A good idea Leah. The drivers are an important part of the equation- Ed. 1. Group General Manager of Marketing at Myer resigns after 1 year. 2. Westfield to apply its shopping centre expertise to airports. 3. Myer’s Christmas window has Melbourne theme based on children’s book Little Dog and the Christmas Wish. 4. ARA predicts 3.6% higher Christmas sales this year. 5. China’s Singles Day sales extravaganza tops out at nearly $2.8 billion in just 17 minutes. 6. Milan Direct launches Australian made furniture category on website. 7. Foreign store entry into Australia continues at high rate in 2015. 8. ACCC says Chrisco Hampers terms “unfair”. 9. Macy’s slashes profit forecast. 10. World’s largest brewer, Inbev, buys SAB Miller group including Fosters. 11. Microsoft unveils Sydney flagship store. 12. Highpoint Apple store apologises to students over racial profiling error. 13. Myer introduces pop-up online handbag manufacturer, Mon Purse. 14. Former Best & Less boss joins Woolworths Board. 15. Apple to open in Singapore with first solar-powered store. 16. Specialty Retail says Rivers brand back on track to become profitable. 17. Temple & Webster acquires Milan Direct in $20m deal. 18. ASOS launches affordable bridal selection for 2016. 19. Apple Pay arrives in Australia through Amex. 20. Target to introduce specially trained staff for premium customer service. 21. H&M’s brand, Cos (Collection of Style) opens in Sydney. 22. Kathmandu reports stronger sales for new year. 23. Australian accessories chain, Lovisa, looks to UK expansion. According to Australian Giftguide Magazine a recent survey of 265 retailers found that only four brands received perfect scores on customer service - Apple, Lush, Nespresso and The Body Shop. 5. Store look and feel. 6. Consistency of website experience. Major deficiencies were found in customer service with 60% of businesses receiving a zero for staff commitment and 30% didn’t approach a customer within 5 minutes. We have mentioned it many times on this website but customer service is potentially one key area where QVM Traders can nail the opposition. Giving customers a service experience, often with our own little brand of theatre, is at least one sure way of maximising our retail opportunities. Last Sunday we published an article about proposals for the Munro site, particularly the Planning Scheme amendments that would allow high-rise buildings to be constructed on the site. The market has long been the subject of height restrictions around its borders so as to protect the amenity of the area and reduce things like over shadowing. As the city encroaches on the market and particularly as we prepare to shift the current market car park to the Munro site, the city is looking to increase those heights to allow appropriate building construction to take place. A meeting was held at the International Centre on Elizabeth St. on Thursday 19th November and the city presented an explanation of its planned amendment. Full details are available on the City of Melbourne website here. A number of traders and management representatives attended the meeting. At Victraders.com, we are not city planners but we will attempt to give you a layman’s view of the discussions on Thursday. 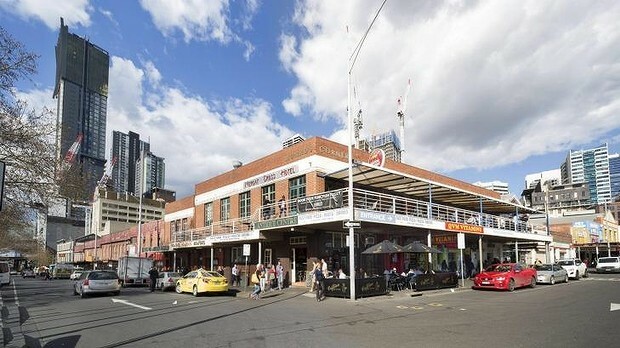 The area of immediate concern for QVM involves the Therry St. and Queen St. frontages opposite the market. The planning amendment seeks to increase mandatory street frontages rising to 20 metres in those locations. That is up to roughly 5-6 stories with the current buildings being around 2-3 stories. Of course behind those frontages there may be constructed high-rise towers but with a minimum of 10 metres setback. 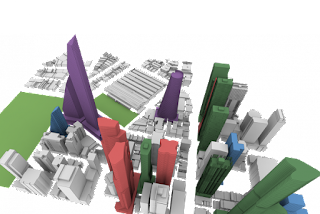 It is understood that the high-rise buildings will be a podium and tower construction (see diagram) with tower separation and building designs that will minimise shadowing and the impact of wind. The location of the Munro Site and the positioning of the market in relation to the sun, means that shadowing impact is expected to be minimal for our market. It is not yet clear to traders just how much impact these tall buildings will have on the light available to the market (sun shadowing aside) or the impact of wind that can arise as a result of building construction. Another aspect of the Planning Amendment concerns re-zoning the market from a Capital City Zone (which may be considered a general CBD business zone) to a Public Use Zone. 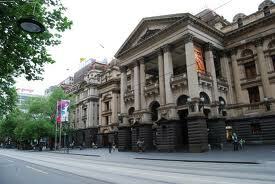 Other Public Use Zone locations in Melbourne include The University of Melbourne, The Exhibition Buildings and Royal Melbourne Hospital. The current car park will be re-zoned to Public Park and Recreation Zone. There will no doubt be more for traders to consider as preferred building plans are released over coming months. In the meantime submissions on the Planning Amendments must be submitted in writing by 4th December 2015. Note: information contained on this website does not constitute advice and may not be accurate. Parties who may be impacted by the matters discussed here are urged to obtain their own advice. Back on 18th October we reported that for the first time a QVM trader had been invited to the National Markets Conference in Sydney. Trader Representatives nominated Ivano Guseli to attend and the conference took place over Thursday, Friday, and Saturday this week (19th – 21st November). The conference is intended for managers and owners of markets so it was significant that a trader was invited this year. We applaud QVM Management for arranging the attendance. Markets from around Australia took part and International markets expert, David O’Neil was a keynote speaker. Ivano will no doubt give us a full report although his initial comment is that it is very important for all markets to speak together in addressing what is a global issue. Looking at some initial notes it is apparent that market managements are looking at similar things to traders – how do we respond to global retail challenges, how do we remain relevant to our customers, how do we enhance our unique features as markets? You will remember that traders John Magno and Raphael Kern raised the idea of a magnetic vehicle sign that traders could attach to their market vehicles and create some instant advertising. We are pleased to advise that the signs are now available through the QVM Co-operative Marketing Program and unless you have already used up your $500 allowance for 2015/16, they won’t cost you anything. That’s right, a pair of magnetic signs for your vehicle are available for free. You are simply expected to look after them and you might want to wash your vehicle every now and then so the market keeps up appearances. There are a limited number of signs available so please don’t delay. Click here to download an application form, fill it out, and submit to the office. You will soon be advertising the market for the benefit of all traders as you drive around on business. The signs can of course be removed for other occasions if you wish. Like any worthwhile cause the debate around the future of The Queen Victoria Market has created different camps - different points of view that can clash and disrupt. If there is common ground to be found then that would be a good thing. In the Trader movement itself it can be said that there are two camps - one that sees a need for change and one that says "leave our market alone". You can see these opposing views in action during debates over issues like the E/F Shed food court. One side wanted to explore the benefits that could come from re-invigorating and re-arranging the top end of E/F Shed, while another said "Forget it. I'm not moving". E/F Shed is a very interesting example of the difference between a world view of our market and a view focussed on individual businesses. A world view sees the decline in our market and the need for structural change. It acknowledges that there are some major structural shifts in global retailing that require a whole new look at the way we do business. An individual business view sees the decline in our market and says fix it, but don't expect me to pay for it and don't upset my business in the process. In fact it is unfair to categorise views so narrowly and to somehow diminish the right of small businesses to be concerned about their immediate welfare. The camp who wanted to trial an E Shed Food Court probably included many F Shed food vendors desperate to turn around their own businesses. It is equally unfair to dismiss the need for change – the evidence around the world is compelling. Somehow the divide in thinking needs to be closed and a way forward found. An interesting take on the MCG/AFL analogy came up recently. It was suggested that at QVM management wanted to be the MCG and operate a property for hire by traders (just like the MCG hires out its ground to the AFL and others), and traders wanted to set up an association to protect their rights (like the AFL Players Association). But nobody really wanted to look after the market (nobody wants to be the AFL, the true custodians of the game). That is the gap that both traders and management need to fill. There is a lot of work to be done here. There is some heavy thinking going on within management and trader ranks right now with a meeting held on Trader Governance just yesterday. Obviously we need to get this right, and traders will be crucial to the outcome. 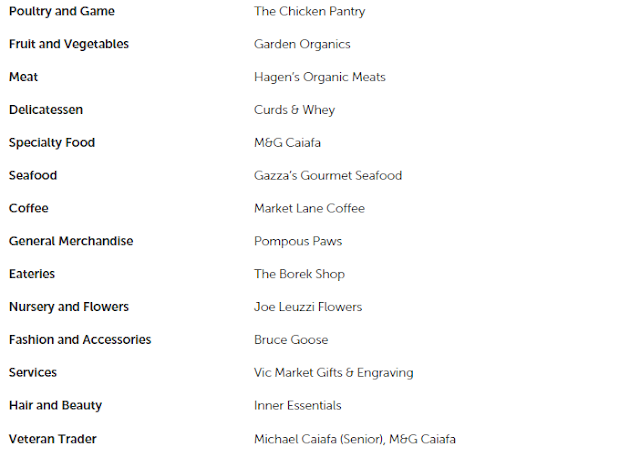 Our congratulations to the following QVM traders who topped their categories in the Melbourne Market Awards and particularly to Curds & Whey and the Chicken Pantry who won their categories across all Melbourne Markets. 1. Koko Black, the luxury chocolate maker, has entered voluntary administration. The operator of 14 stores across Australia, including one in our own QVM deli hall, is believed to have fallen victim to a rate of growth beyond its resources. The business will continue to trade over Christmas as administrators consider future options. 3. Acland St to ban cars. This St.Kilda shopping destination is to ban vehicles and create an open air plaza under a plan to be put before Port Phillip City Council in December. 4. A British retailer introduces pedestrian fast lane. Argos, the giant catalogue retailer has introduced a fast lane at its Liverpool (UK) store following research that found more than half of shoppers hate slow sidewalks. Back on 1st November we published an article about the fuss caused by a builder leaving two underground car parking levels out of their new city skyscraper near the market. The car parks were in the building approval but never constructed and the city was trying to work out what penalties should be applied. We wrote "One suggestion offered to Victraders.com is that they could be required to build two levels of basement parking at a nearby location - maybe under A, B, C sheds at QVM?" "1. The developer will have to provide or purchase the equivalent number of parking spaces of the same dimension as those under the plan elsewhere in the CBD. " We like the idea Councillor. A proposal by Melbourne City Councillor, Richard Foster, to ban vehicles from the CBD has been criticised by Lord Mayor, Robert Doyle. Both Lord Mayor Doyle, and State Premier Andrews have said that the idea is not realistic. “Only people who live very close to the city and perhaps don’t drive a car could come up with an idea like that”, Mr Andrews said. Rolls Royce share price tumbled 22% this week as the exclusive car maker warned of flat demand while Monk Shoes has just opened a new store in Sydney selling its $2,000 pairs of men's shoes to aspiring young business men. Confusing isn't it? These two high-end businesses appear to be experiencing quite different consumer responses and it is not just that difference that raises questions but also the general question of how in a time of global austerity we are seeing strong demand for seemingly expensive items. Apple is experiencing strong growth on the back of $1,000 mobile phones and yet Melbourne's Koko Black chocolate stores, selling $95 per kilo chocolate and also considered high-end, has just gone into receivership. It is OK to be confused, but one lifeline that springs regularly from retail commentators is the importance of communicating, really communicating, with your customers. The business comparisons in this article can obviously have hundreds of reasons for their variation but for a market trader understanding why your customers are doing what they are doing, or more to the point, spending what they are spending, is really quite easy. It comes down to the questions you ask when they walk into your stall. How is their shopping going? Are they finding the things they are looking for? What can you offer them that would meet their needs? We can probably all agree that there are fewer stereotypes in today's retailing. It is a whole new ball game whether you are selling Rolls Royces or socks. Regularly asking questions to keep in touch with customers and what is driving their buying decisions certainly makes a lot of sense. And in the process you might just win a friend and a customer. According to the Financial Review, signet rings are the latest trend in jewellery with such diverse celebrities as Prince Charles and Rihanna sharing the passion. Innovations in signet ring design go from the classic inscribed ring through plain minimalist designs to the most elaborate bling your heart and dress sense can muster. In a world full of fashion and identity statements, wearing a distinctive ring makes a refreshing change from T-shirts, mobile phones and even hairstyles. 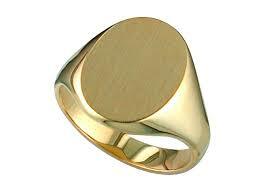 QVM jewellery traders - are you ready for the trend? Decorating a 7 hectare site is always going to be a major challenge and getting the “best bang for your buck” is what faced our management team with this year’s Christmas decorations. 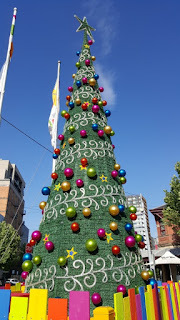 We like the way they have taken up last year’s concerns about the lack of daytime impact for the giant Christmas tree. 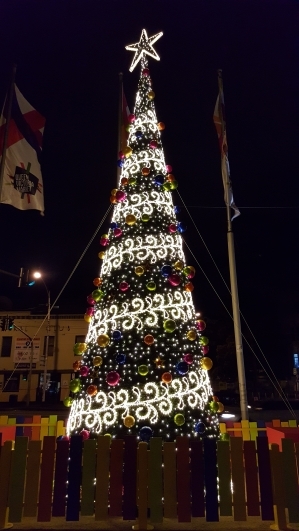 This year, the bright and colourful baubles add a welcome vibrancy to the tree and of course the night time lights still look great. 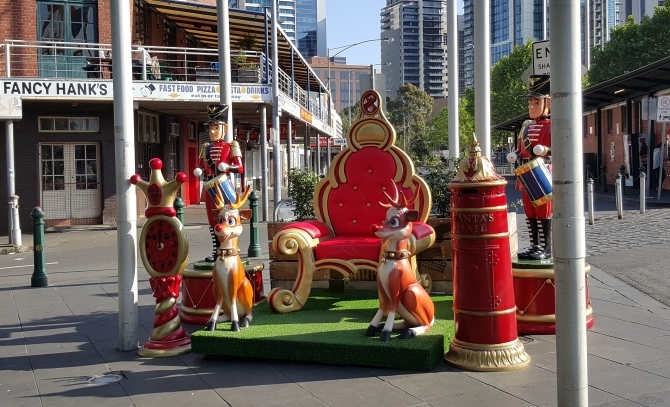 The Santa setting on the corner of Queen and Therry Sts looks to be a winner if the response at the Friday Night Market is any guide. It makes an excellent photo-shoot location and could just inspire QVM to make that a permanent “selfie spot” with different themes throughout the year. Wreath – located in the same position as last year, on the front of the Meat Hall. The wreath has had some new decorations added gain to align to new brand colours. The wreath will be lit at night. Golden glittered stars- These stars were used last year under the sheds and around the perimeter of the site. The same application will be in place this year. Garland- The fairy lit garland will be again draped throughout the dairy hall. This will be the same installation as last year. 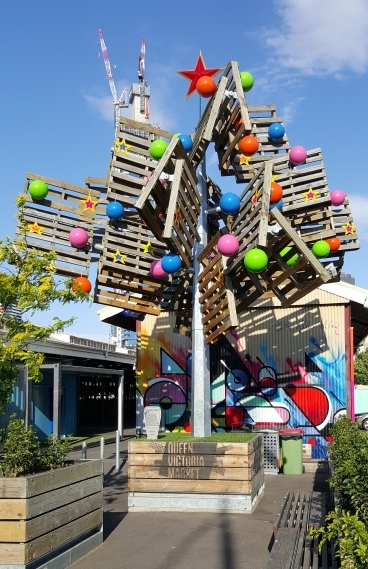 Pallet Tree- As the main entry point for the tourist bus QVM felt it was important to create a welcoming entry point. 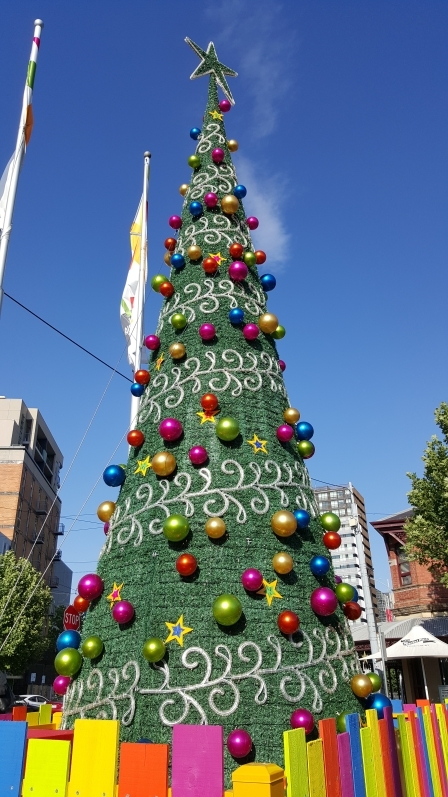 The Pallet tree will be decorated and lit to create a contemporary and modern style Christmas tree in its own right. Major Roofline Installations- These two installations will be the biggest change and impact for the new decorations. They will be located firstly on the roofline at the corner of Therry and Elizabeth St and secondly at the corner of Peel and Victoria St. These installations are large scale , full of colour and have both daytime impact and will be lit at night. Posters, flags and banners will also be part of the Christmas campaign this year along with normal media involvement and also the inclusion of the Salvos with a gift giving tree and onsite carol singing. The City of Melbourne is proposing planning changes to the QVM precinct with particular relevance to height restrictions on Therry St. and Queen St. QVMAC Trader Representatives have been invited to make submissions and we need input from traders. If Therry St is to remain a dedicated retail area in tune with the market, what is an appropriate height for street frontage, and what impact will a high-rise have adjacent to the market? What other considerations will affect market business – light, wind, vehicle traffic, pedestrian amenity? The graphics shown above (thank you Urban Melbourne) gives one designer’s concept that takes in light and wind considerations for the Munro site. What sorts of questions do you believe we need to ask on Thursday to give traders a better understanding of the impact of the amendments proposed around the market? 1. H&M opens its new Pitt St. Sydney store. 2. Rip Curl posts strong growth. 3. Small Business Minister says shoppers need to give greater support to small businesses. 4. Debate starts over potential GST increases. 5. Australia Post to trial drones in 2016. 6. After being instrumental in killing off many bookshops, Amazon is opening its own bricks’n’mortar book store. 7. Westfield introduce infra-red body mapping pods to measure customers for clothes in 7 seconds. 8. Singapore Post to open new shopping mall with online and instore retailers under one roof. 9. ARA says September retail sales rise but less than hoped for. 10. Marks & Spencer profit declines on back of lower clothing sales and international performance. 11. Dr. Who pop-up shop lands in Sydney. 12. Glad Wrap claims top selling product in supermarkets. Lost And Found At QVM – An Important Service. What Is The Primary Role Of The QVMAC?